Yet another bumper selection for you all as the winter timetables for First Kernow take effect from the 27th September. I can offer you the timetables and where updated maps but FK have not yet made any announcements about the changes due (quite unusual for them to leave it this late) so I cant offer you much detail just yet. 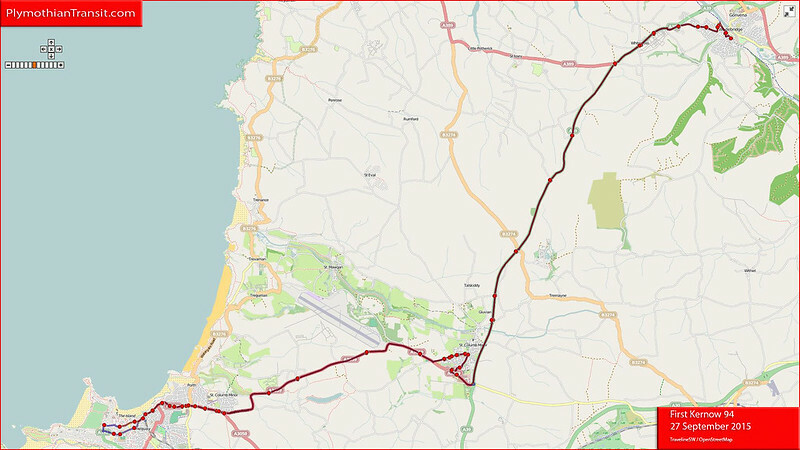 If and when the full news is released I will update the route pages in Plymothian Bus Services which are linked to below. Plymouth to Looe reduced to every two hours, Looe Bay hourly. Some peak journeys extend to Pelynt from Looe, but no 72 buses serve Polperro. Now serves Camping Caradon, with last journey Liskeard to Polperro withdrawn. Three non dda darts, one non dda B10B and a coach are at The Ride awaiting collection for scrap. And finally the four South a Devon vans have gone to Cornwall. Topoint is now being used to store redundant buses, mostly from the Kernow fleet prior to disposal. Buses noted there so far include 34063 34064 34192 34193 34194 34196 34197 34199 34200 34259 34261 42841 48264. These include the former Airbus fleet of Olympians which will be missed by many people! The fleet have now officially been re-registered back to their original N registrations although most still carry their non-dating plates. I would imagine that their numbers will reappear on other buses some time soon. Much of this information has come from contributors to the RailUKForums First Kernow discussion board. Are there any pictures available of the vehicles parked up at Torpoint ? Yes - there is one in the Cornish Times this week with a news item that local people are unhappy. They are not too impressed with the Citybus service, either. 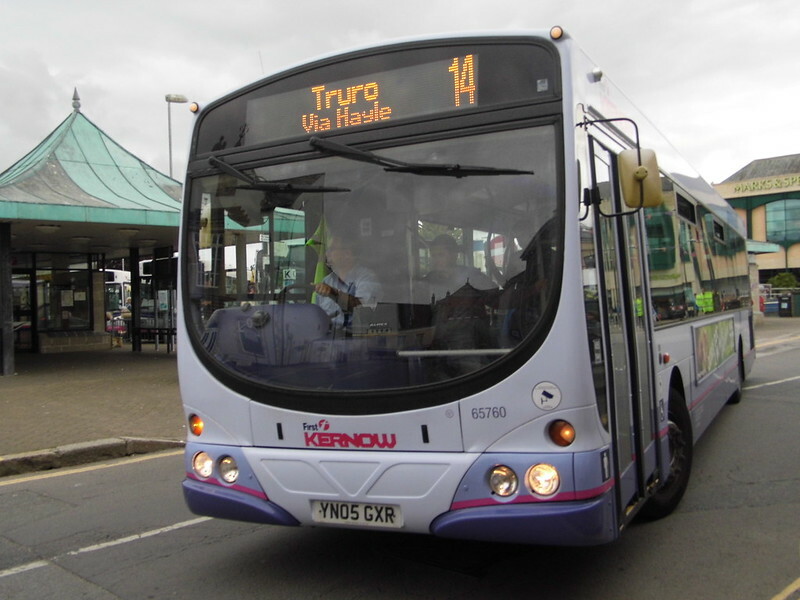 If the withdrawal of First has left PCB struggling to cope with the Torpoint passenger traffic, would it be possible for them to ask the Traffic Commissioner for permission to operate short-notice extra journeys until they can sort out and register a permanent timetable? Fear not as I believe Stagecoach will be in Torpoint before too long. Just give them time! This could be a great game plan by Stagecoach here.. Don't register replacement services on old First routes, leave Citybus with monopoly, watch them struggle for a while , as obviously they can not cope with all these routes/passengers then hey aren't we wonderful, here is your new Stagecoach service, knowing that they are guaranteed to pick up passengers totally fed up with Citybus service, Basically they could turn up with old horse and cart Stagecoach and people would use them!! They can also put up fares by quite a bit and still be cheaper than Citybus...In the meantime , Citybus will not be able to retaliate as they will be in a mess and can not re register Tavistock etc so soon after pulling out as customers won't be interested. Game set and Match to Stagecoach! Anon 17:05 - for what reason exactly do you expect Stagecoach to go out of their way to provoke Citybus by doing this? It would make no sense. Stagecoach will go Torpoint next year, Citybus are making such a pigs ear of it they will not be able to resist such was picking to build the business up. Also has was previously stated what can citybus do, they just pulled out of all territory they could retaliate to and can not cope with what they have got now.. Torpoint service is awful as is the 40/41 and 44 to start with.